In January of 2008, Microsoft Corporation released a much anticipated update to Office for the Mac. Optimized for both Intel and PowerPC-based Macs, Office 2008 introduced loads of new and improved features. Support for Open XML file formats, suite-wide interface consistency with a more Mac-like look and feel, Excel ledger sheets, new templates and themes, a publishing layout view in Word, and the ability to directly save Excel workbooks, PowerPoint presentations, and Word documents as PDF's are just some of the many reasons for users to upgrade. Another new feature in Office 2008 is support for Automator. 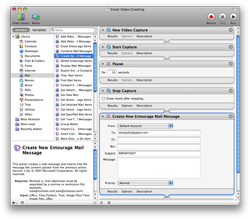 Automator is an application that was developed by Apple Inc., originally released as part of Mac OS X 10.4 Tiger, and fairly significantly updated in Mac OS X 10.5 Leopard. Automator's purpose is simple. It allows you to automate simple workflows, thus saving you time and allowing you to focus on less repetitive tasks. Within Automator, workflows are comprised of actions. Each action in Automator typically performs a single specific task, and may have modifiable settings, allowing you to adjust its behavior. A workflow is constructed by arranging one or more actions into a sequence. You can then run the workflow at any time to perform the desired tasks. Mac OS X includes hundreds of Automator actions for performing tasks in Apple applications, or within the operating system itself. The list of actions available within Automator, however, can be expanded even further by installing third-party actions or applications that include Automator actions.Automated Workflows, LLC has been working with Automator since its initial release, and has developed actions for applications including InDesign, Photoshop, QuarkXPress, and more. In 2006, Automated Workflows, LLC was the recipient of an Apple Design Award for the Best Automator Workflow at Apple's Worldwide Developers Conference. Ben Waldie, president of the company, is the author of Automator for Mac OS X 10.5 Leopard: Visual QuickStart Guide (Peachpit Press), and has also written numerous Automator articles and tutorials for Apple.com and Macworld Magazine, as well as many other publications. When Microsoft decided to implement Automator support in Office 2008, Automated Workflows, LLC was approached for guidance and assistance. Under contract to and working closely with Microsoft, we developed an initial set of over 90 actions for Entourage, Excel, PowerPoint, and Word, which allow users to automate a variety of common tasks within Office. Many of these actions are useful on their own for performing tasks such as converting documents from one format to another, printing documents, or applying document settings. The real power, however, comes with the ability to integrate the Office actions together, or with actions for other applications. For example, using Office 2008's Automator actions, a user could create a workflow that retrieves photos from an Entourage email and brings them into iPhoto, converts a Word document to PDF format and uploads it to a web server, or extracts web content from Safari and adds it to an Excel workbook. Office 2008 also includes dozens of example Automator workflows, to demonstrate action use and help users to get started. Of course, Office 2008's 90+ Automator actions can't do everything. 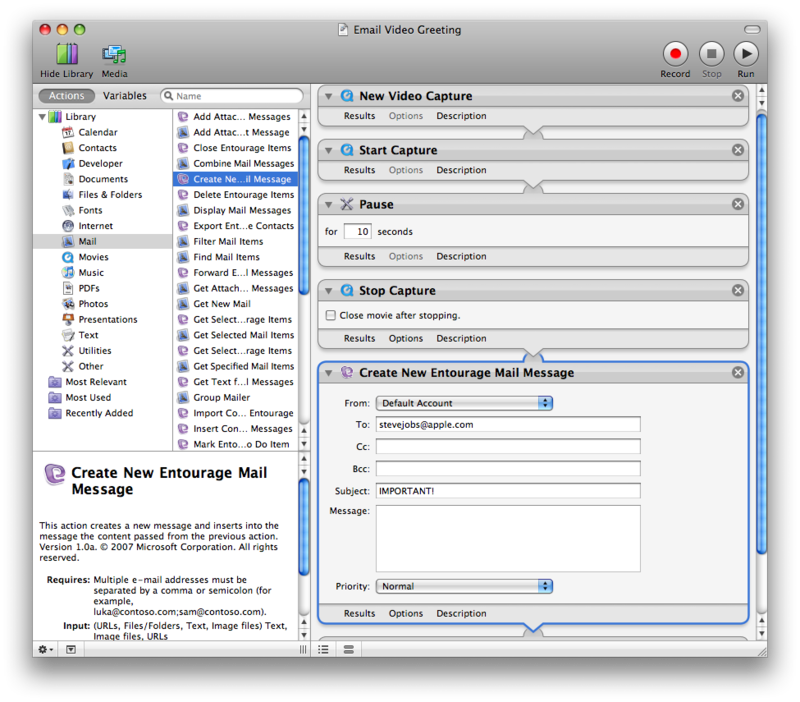 Like Automator itself, these actions are designed to allow users to automate some simple tasks within their daily routines. For more complex tasks, Automator may not be the ideal solution. In these cases, however, users are not out of luck. Office 2008 includes extensive AppleScript support. AppleScripts can be written to automate almost any task that can be done manually. Whatever Office workflow you're looking to automate, from the small to the complex, Automator or AppleScript can help. In January 2008, Ben Waldie, president of Automated Workflows, LLC, demonstrated the Office 2008 Automator actions at Macworld Conference & Expo during Microsoft's Day at the Office session. PLEASE NOTE: They are not included in the Office 2008 for Mac Home and Student Edition. Microsoft, MSN, and the MSN logo are either registered trademarks or trademarks of Microsoft Corporation in the United States and/or other countries.